I went on a great 7.5 mile hike along the Ocklawaha River this morning with my son. We started at Moss Bluff Dam and walked the dike to the trails end at the county road 42 bridge. We saw hundreds of black vultures, a number of hawks of different varieties, a lone gator trying to get warm, a bald eagle and a variety of smaller birds. 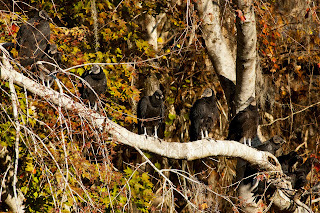 I took this photo of a group of vultures sunning themselves as the fog lifted. I highly recommend this trail as we were the only two humans except for a few fishermen in their boats. I love Florida winters - this photo shows some fall foliage, some bare winter trees, and new leaf buds all in the same tight shot.